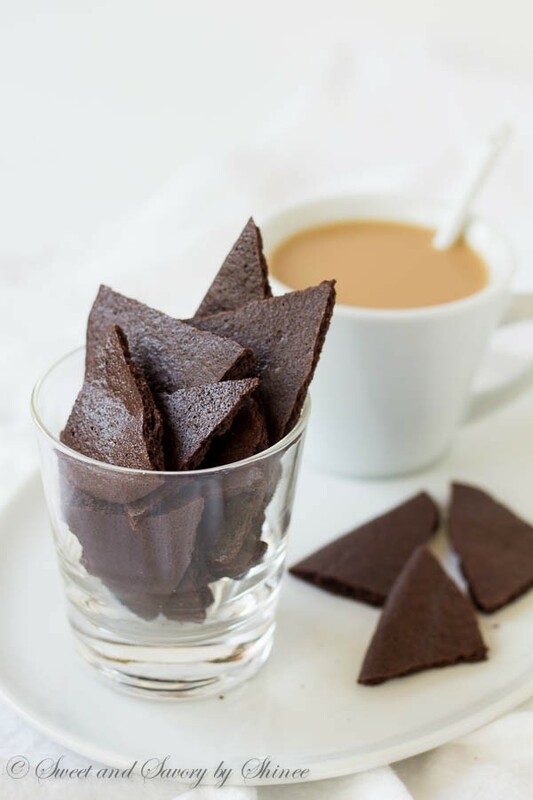 Crisp, rich and addicting, these thin brownie crisps will quickly become your favorite way to finish your morning coffee! So earlier this summer, I had a few trips in and out of the country. Lots of layovers, airport food, and sleepless nights. Not to mention, I was in my very early days of pregnancy!! I had to munch on something frequently to avoid queasiness. Anyway, on my longest layover at the Denver airport on my way from Mongolia, I was delighted to get my feet up and relax at one of United clubs. But first, I checked out their buffet area as I usually do. 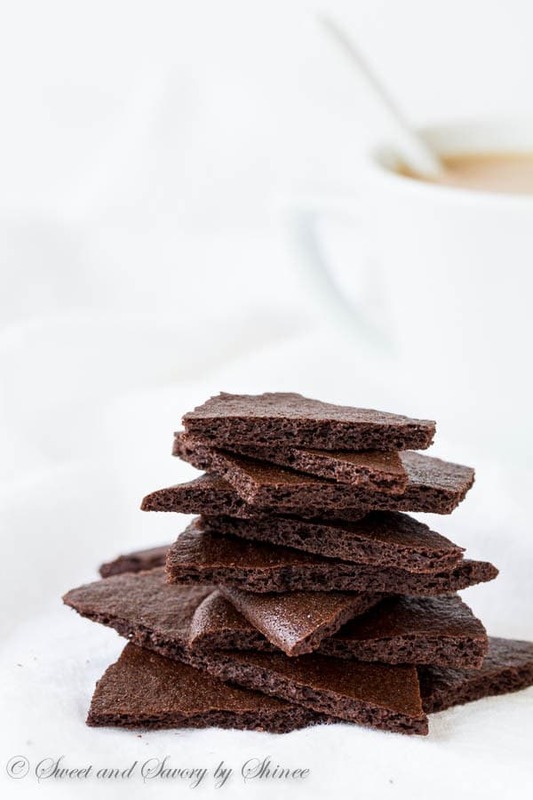 After a small bowl of hearty soup, which hit the spot, I poured myself a cup of tea and grabbed a few of those delicious-looking brownie crisps for dessert. I mean, how could I pass by a gigantic bowl filled with thin, chocolate-y treats? Oh, man, was I in for the treat!! Let’s just say, I’ve made numerous trips back to the buffet for refill. Since I couldn’t stay (nor did I want to) at the airport lounge and enjoy those crisps indefinitely, I was determent to recreate those treats at home. But I had no idea where to start! What I did know was that to create that awesome crispy texture, I didn’t want much fat in the batter. So no butter, no solid chocolate and no egg yolks. Instead, I opted for egg whites only, cocoa powder, instead of melted chocolate, and a little bit of vegetable oil. My biggest problem was cake-y, soft texture. So, I reduced the flour amount to 1/2 cup and added a little bit of cornstarch. Why cornstarch, you may wonder? Well, cornstarch in baked goods, like cookies, adds more tender crumbs, but in our case, it actually helps to dry out the brownies, creating crisp, crunchy texture. Next, espresso powder. Now it’s not essential ingredient here. A little bit of espresso powder usually boosts the chocolate flavor without coffee flavor. But I have to admit, I loved the slight hint of coffee in my brownie crisps, when I bumped up the amount. Let’s talk about sugar. When it comes to chocolate, I love its dark, intense flavor, and I tend to use less sugar in any of my chocolate treats. Here in my recipe, I call for only 1/2 cup of sugar. 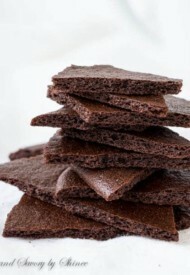 My aunt Rosann, who also happened to love brownie crisps, tested this recipe and reported she liked it with more sugar. (She increased sugar to 1 cup in combination of Hershey’s Special Dark cocoa powder. Thanks, aunt Rosann, for your feedback!) So, if you love sweeter treats, feel free to increase the sugar amount. Parchment paper vs silicone mat. As I had made these brownie crisps many times now, on both parchment paper and silicone mat, my final verdict is to go with parchment paper. 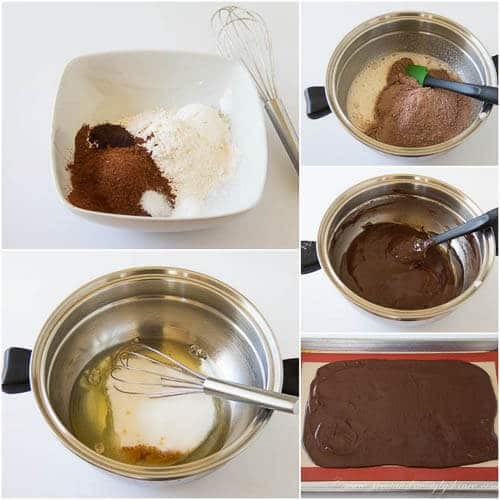 I found that when I bake this on silicone mat, I have to either bake it longer, or bake it twice (second bake is for just 5 minutes without the mat). Whew, are you still with me? Kudos to you, if you’re still reading! ?? I’m so very happy with this recipe, and I know you will love this treat as well! By the way, this is just a beginning, a clean canvas, if you will, to get creative with add-ons. I have lots of variations in my head that I’ll be sharing with you soon! 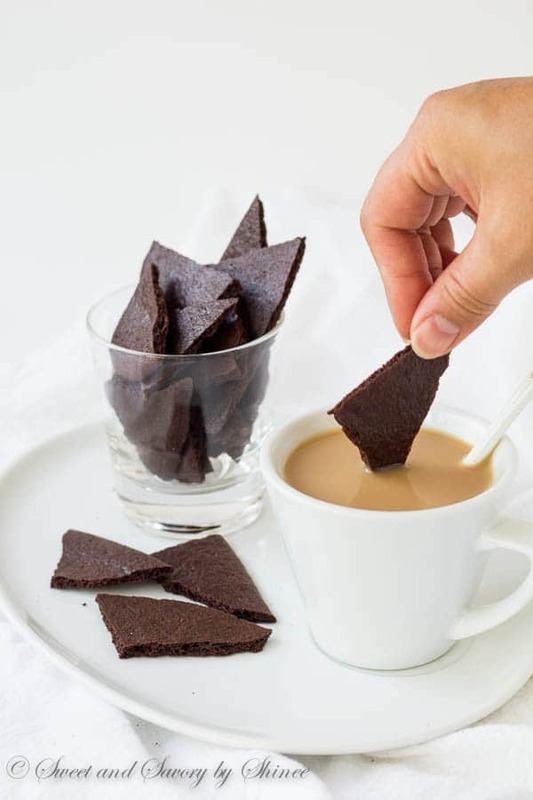 Garrat and I enjoy these brownie crisps dunking in our morning coffee and discussing our plans for the day. The best way to start a day! Oh, and dunking in the coffee, or tea, is a must though!! ?? ? Hope you enjoyed today’s recipe! Thank you so much for reading! In another medium bowl, beat egg whites with sugar and vanilla extract until foamy. Add the dry ingredients and mix until smooth. Stir in the vegetable oil. Pour the batter on the prepared baking sheet. Using an offset spatula spread the batter evenly into a thin layer. Bake for 25 minutes. The brownie will be on the soft side, but it’ll harden as it cools. Transfer the baking sheet onto a wire rack to cool completely. Break the brownie crisp into small pieces and enjoy! Store in air tight container at room temperature for up to 5 days.